Jeff Morris with a nice bright salmon caught on the Northwest Miramichi, Saturday, June 3. 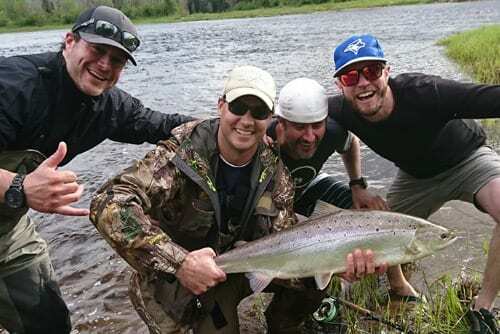 MIRAMICHI – The sea trout run has petered out except for the above Boiestown area. There are some river trout and still some striped bass in places. Bright salmon are gradually making their way into the system as we begin the move from spring to summer fishing. W. W. Doak and Sons in Doaktown said water conditions were good in both height and temperature. There were some reports of bright salmon. One was reported in the Doaktown area, two in the Boiestown vicinity and one above Norrad’s Bridge. Last week there had been some sea trout reported in the Doaktown area, but they had pretty well gone by there, although some were still being hooked in Boiestown and above. Getting an accurate report was a bit difficult as there were not a lot of anglers actually out. It was hoped that this week’s full moon tides would bring more fish into the system. Flies of choice were Butterflies and Green Machines for both trout and salmon, and Caddis, Wulffs and Muddlers for trout. Andrew Anthony of Ledges Inn in Doaktown and Mountain Channel in the Rapids area said they had caught a 12-pound salmon last Wednesday and had heard of another in the Boiestown area on Friday. Water conditions were good, but dropping. The water temperature in the Dungarvon on Tuesday was 58 degrees Fahrenheit. The sea trout run had gone by, but anglers were still picking up river trout. Flies of choice were Black Ghosts, White-tailed Green Machines, Glitter Bears and Stone Flies on no. 6 hooks. Herb Barry Sr. of Herb’s Fly Shop on the Station Road in Blackville said there was not much happening yet. He had rumours of a couple of bright salmon along the system, but none there yet. Anglers were using Blue Smelt streamers for bass in Quarryville on the weekend. There were a few river trout and a very odd sea trout, but the run had gone by. The water was pretty good, but it would be very difficult to run a boat. Flies of choice were Humpies and Muddlers for trout, and Blue Smelts for bass. Curtis Miramichi River Outfitting in Blackville said the water was a good level and good temperature. Reports of sea trout had slowed and there were no bright salmon yet. Flies of choice were Rat-faced McDougalls, Muddlers, Green Machines and Bombers. Jim Laws of Miramichi Hunting and Fishing in Newcastle, Miramichi reported hearing of an odd salmon or two on the Northwest and an odd big trout. Striped bass fishing was quiet, but hopefully would pick up as the make their way out after spawning. Water conditions were good. Flies of choice were White-tailed Green Machines, Black ghosts, Butterflies, Muddlers and Wulffs. 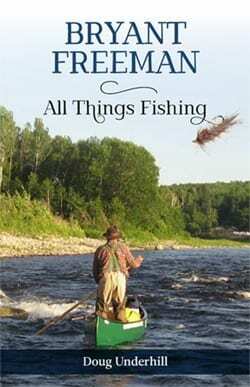 Syd Matchett of Trout Brook Fly Shop on the Northwest Miramichi said angling was gradually improving. There were four bright salmon reported on the weekend and three more Wednesday morning. There were some trout in the 12-14 inch range, but the sea trout run seemed to have gone by as there were already some trout at the Northwest Barrier. Water conditions were good in both height and temperature. Flies of choice were Green Machines, Black Ghosts, Yellow-winged Butterflies, White-winged Butterflies, Shady Ladies and Buck Bugs with yellow tails on nos. 4 & 6 hooks. Debbie Norton of Upper Oxbow Outdoor Adventures on the Little Southwest Miramichi said she had heard of some salmon on the Northwest and had seen some in the pools. There were no brights reported on the Little Southwest yet. There were still lots of striped bass around and anglers using flies were having good luck above the Red Bank Bridge. The close to 10 kilometers below the Red Bank Bridge is still closed to all fishing until June 9, but the closure ban will be lifted June 10. The water was a good temperature, but getting low for the time of year. Flies of choice were Poppers and Deceivers for bass, and Butterflies, Green Machines for salmon on no. 4 hooks. So as we continue to move forward into June, with the full moon tides upon us, and possibly bringing in more bright salmon, it is time to get out and “on the water”. Yesterday ASF released its 2017 State of the Populations report, based on the most recent data for North American salmon returns and harvest. The report also provides details on the productivity of a large selection of rivers, and urges the Canadian government to be assertive in upcoming North Atlantic Salmon Conservation Organization (NASCO) meetings in Sweden. ASF Rivernotes has coverage of the initial day or days of the season in regions from Newfoundland to Quebec. Check out photos of yesterday’s Opening Day in NL. There is also news on the management of Larry’s Gulch Salmon Camp on the Restigouche. Flies came our way from as far away as Hokkaido, Japan. Now the results are known for the contest held in honour of Canada’s 150th. A commentary by ASF’s Neville Crabbe looks at the predicted affects of global warming on Atlantic salmon. This is a syndicated post. You can view the original post here: Miramichi Fishing Report for Thursday, June 8, 2017.